Affiliations: Hodgins (his driver), Sibyl Carruthers, his small band of warlocks and witches, The Abomination (intended pawn). Powers/Abilities: Adept at sorcery, but requires long incantations, and his sorcerous power is nowhere near that of accomplished sorcerers such as Dr. Strange. History: (Silver Surfer I#12)- The Warlock Prime, surrounded by members of his band of sorcerers, is seen saying a magical incantation, and burns down a wall of the house he is in. As he exits, he speaks of how sorcery began as a hobby, but has now dominated his life. He says that he will do something to prove their power to the world, and no one will dare laugh at them anymore. At that moment, he sees the Silver Surfer fall in front of his car, after being struck by some meteors. He gets an idea, and he takes the Surfer to his home, saying soon the world will know that sorcery killed the Surfer. When the Surfer wakes up, the Warlock Prime offers him some broth. Unfortunately for the Surfer, it was actually a potion and it knocks out the Surfer. They bring the surfer back to their sanctum (whose wall has somehow been repaired) and summons something that could kill the Surfer, and the Abomination appears before them. 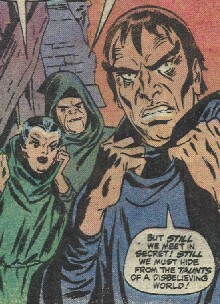 Abomination goes on to tell them that he was a prisoner of the Stranger before they summoned him. The Abomination however, is unwilling to be the pawn of the Warlock Prime, and he throws him, severely injuring him. The Abomination then hops away. While the Warlock Prime lay dying, his wife is going on about how they need to save him. The Silver Surfer wakes up and tells them to stand back before using his cosmic energy to revive the Warlock Prime. The Warlock Prime isn't thankful, and he orders the Surfer to catch the Abomination. The Silver Surfer doesn't want to listen, and he flies off. However, he encounters the Abomination and defeats him anyway. 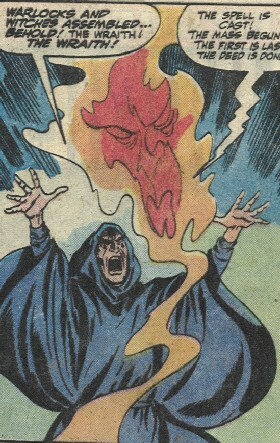 The Surfer brings the Abomination back to the Warlock Prime, and orders him to send the Abomination back to where he came from. A potion knocked out the Surfer?! What was in that thing?! He though he could control the Abomination. I guess he should have done his homework better. For those of you wondering, the Warlock Prime did indeed return Abomination back to the Stranger's world, but he later escapes, since he appears in the Hulk#136 as the first mate of a spaceship, though it offers no explanation of how he escaped the Stranger. The Warlock Prime and his coven were trying to summon forth the Nameless Ones, which would most likely be the Old Ones, as discussed under the Elder Gods clarification. Prime of Earth-Ultraverse, Kevin Green, @ Prime I#1 -- or any other incarnations, duplicates, etc.